This league is currently in progress and is scheduled to end on June 02, 2018. 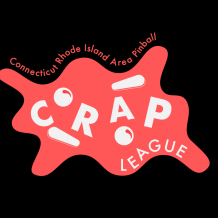 The Connecticut Rhode Island Area Pinball League. Our second season kicks off the week of April 2nd. The Sanctum starts that Monday the 2nd at 7:30 PM with doors opening at 6:30 and R.I.P. starts that Wednesday the 4th at 7:30 PM with doors opening at 6. Cost will be 20$ for the season plus the usual weekly entrance fee for the location you are playing. This will be an IFPA sanctioned event. League will consist of 8 weeks of play. You will play in groups of 4 or 3 when needed. You will play 4 games a night with each player choosing a game. Points will be 7-5-3-1 and 7-4-1. You can play at either location each week but only one location per week. League will consist of 4 divisions. A/B/C/D. Each division will have 16 players except D will have however many are left depending on league size. We are guessing around a 70 person league for this first season. No division lines will be set in stone. Everyone will be able to move up and down all season. Everyone will be invited to finals on June 2nd at The Sanctum. We will payout equally across all 4 divisions to the top 4 finishers in each. Trophies for the top 3 in each division will be awarded as well. We will fill each division from the top down on the day of finals. If only 15 of the A players show up the 1st place player in B division will move up to A and the second place player in B division no becomes the first place player. This goes on down the whole line filling the divisions to full 16 player field. Finals will be a Matchplay elimination bracket. Four groups of four play four games and the top two from each group move on to the next round. All major tournament rules for issues and malfunctions will follow the IFPAPA rules.